He also revealed (and it is widely known in the community) that he doesn’t want his wife, Denise Block, to know about his involvement. She was asked to leave her job as an educator at Community Church in Orange after the school informed her that her family’s values didn’t align with the school’s. It’s also widely believed in the community that she disapproves of the memorial and her husband’s involvement. Groups of local pastors, business leaders, and even the city of Orange government have asked Block to engage in discussions of how the memorial is affecting and will affect the community and public perception of the community. The city has offered to buy the property. Block refuses to engage with community members who oppose the memorial. Multiple mainstream media outlets have written about the site, bringing it national attention — all of it glaringly negative. These include an ESPN story about football star Earl Thomas, who grew up in Orange (“Earl Thomas is the favorite son of a troubled Texas town”). The 97-year-old grandmother of one of the opposition organizers received an anonymous letter alleging that her granddaughter’s husband fraudulently obtained a graduate degree and that he is not the biological father of her great-grandchildren. The unsigned letter also purports to describe her granddaughter’s sexuality. Orange residents have reported hearing Block regularly use the “n” word when referring to blacks. An artist’s rendering of the site, circulated by Block, follows below. It includes his home address and cell phone number. Click the image for a larger version. Although Block refuses to share information on the memorial’s future, he recently began work on the site again. Please join us on September 22 as we protest Block and the memorial. 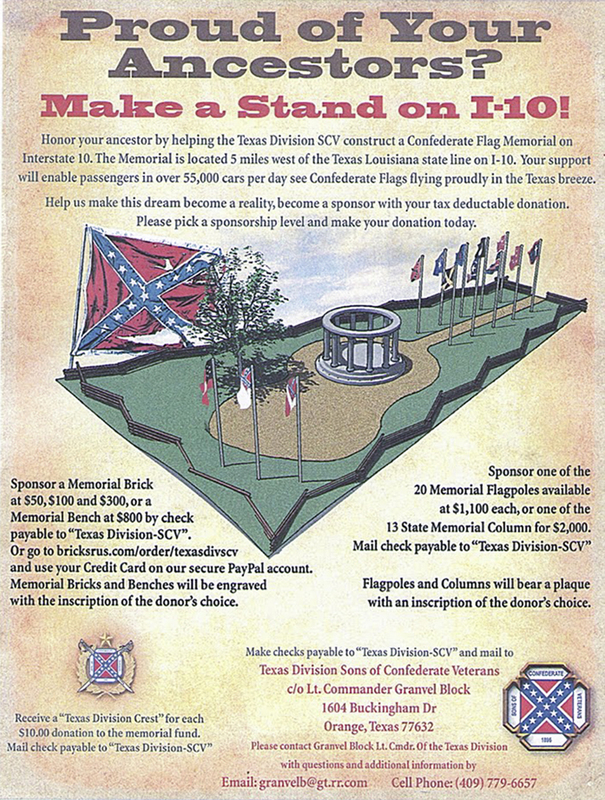 It’s our goal to let Block and the Sons of Confederate Veterans know that the overwhelming majority of Orange residents oppose the memorial and that its conspicuous location doesn’t align with community values in Orange. ← Protest: Saturday, September 22, 10 a.m. – 12 p.m.